A game set in the same year as today for this month, how very convenient. There was an arcade game called "STG Strike Gunner" by Athena set in the year 2009, but its not a very good quality vertical shooter. This game is very differs a lot in its scrolling from the fixed widths and heights Mega Man has which gives it a more spacey feeling and the multidirectional shooters has a better advantage. I was surprised that the game had little to no connection with the original Street Fighter franchise and none at all with the Final Fight trilogy. 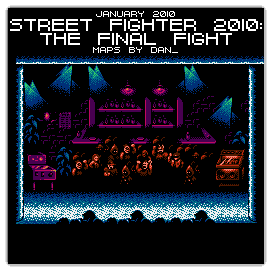 How appropriate to start the year 2010 with maps from an old forgotten NES classic set in the same year. So far, this new year is looking good in 8-bit.